On your 2012 calendar, be sure to put a big red circle around June 5. On that day, a celestial occurrence that will not be seen by human eyes until well into the 22nd century — the year 2117 to be exact — will take place. The planet Venus will cross the face of the sun. Through the balance of this winter season and well into the spring of 2012, Venus will gradually climb higher in the sky and grow progressively brighter, eventually becoming an "evening lantern" for those commuting home from work and school. Normally, Venus would pass unseen, hidden in the brilliant glare of the sun. But not this time. 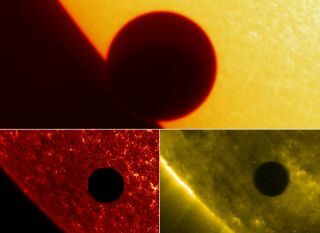 From June 5-6, 2012, an exceedingly rare occurrence is to take place: from here on Earth, we will be able to see Venus cross in front of the sun, making itself evident as a small black spot slowly moving across the solar disk. This is among the rarest of astronomical events. In fact, between the years 2000 B.C. and 4000 A.D., there have been only 81 Venus transits. Humans have recorded witnessing only six of them (in 1639, 1761, 1769, 1874, 1882, and most recently, in 2004). It's not impossible that a transit of this planet might have once been seen by chance in ancient times, near sunrise or sunset. Or perhaps some ancient observer with a keen eye, viewing the sun on an unusually hazy day, might have glimpsed Venus's dark image (reporting it as "a dark mark on the sun") on the solar disk. Soon after the transit of 1882 had taken place, the French astronomer Camille Flammarion, sometimes referred to as the "Carl Sagan of the 19th century" because of his many popular books and articles on astronomy, compiled a listing of transits running from 1631 to 2984. "We see that astronomers do not allow themselves to be taken unawares," Flammarion wrote. "Astronomy is, after all, the only science which enjoys the privilege of reading the future as it does the past, and it avails itself of it. The special details of the 'approaching' transit of June 8 of the year 2004 have already been calculated with precision, as well as those of the transit of June 5, 2012, and we might almost say that the various expeditions are arranged, with the exception of the names of the astronomers who will take part in them." The circumstances of the transits of Venus repeat themselves with great exactness after a period of 243 years. The intervals between individual transits (in years) currently go as follows: 8 + 121.5 + 8 + 105.5 = 243. In other words, a pair of transits may occur over a time span of just eight years, but following the second transit, the next will not occur again for more than a century. On June 5, the entire transit will last almost 6 3/4hours and will be visible in some form across approximately three-quarters of our planet. The beginning will be visible from the northwestern part of South America, and all of North America, Hawaii, central and western Asia, New Zealand and the eastern two-thirds of Australia. The end will be visible from northern and northwestern North America, New Zealand, Australia, Asia, the eastern half of Africa and most of Europe. From the contiguous 48 states as well as most of Canada, the beginning stages occur before sunset. For much of Europe, the sun will rise on the morning of June 6, with Venus already on the sun's disk with the transit nearly over. Unfortunately, those living across the western half of Africa, southern and western parts of Spain, all of Portugal and the central and eastern parts of South America will be precluded from seeing any part of this spectacle, as the sun will be below the horizon when it is taking place. Quite unlike the transits of Mercury, those of Venus are readily visible with the unaided eye. When Venus is in transit across the solar disk, the planet appears as a distinct, albeit tiny, round black spot with a diameter just 1/32 that of the sun. This size is large enough to perceive with the naked eye. However,prospective observers must take special precautions (as with a solar eclipse) in attempting to view the silhouette of Venus against the blindingly brilliant disk of the sun. Looking directly at the sun without eye protection could cause serious injury. As we get closer to June 5, SPACE.com will provide comprehensive coverage of the Great Venus Transit.